Wish Upon could’ve been better but instead was another teen horror movie with some really stupid moments. The only saving grace is probably a respectable and wide-ranging performance from Joey King who does shine. Note: This review does contain PLOT SPOILERS, so reader’s beware! 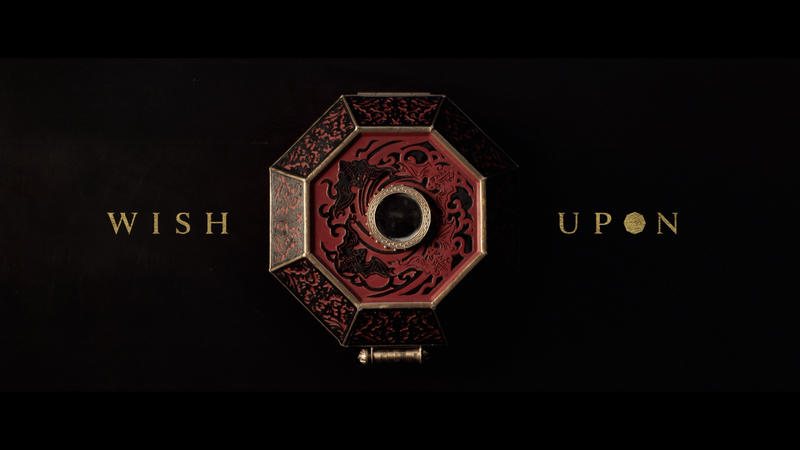 Wish Upon is about teenager Clare Shannon (JOEY KING) receives a Chinese music box from her father (RYAN PHILLIPPE), the writings she understands says the owner is granted seven wishes. With high school being a living hell for her, not to mention dealing with the internal scars of her mother committing suicide 12 years earlier, on a lark her first wish is that a girl school bully would rot. And guess what? Yep, this girl wakes up the following morning and finds her legs and face rotting. Upon discovering this, one would think Clare might not believe this was a mere coincidence, but… I guess she does. Oh, and we quickly see what happens when a wish is made, as someone close to her dies (in this case, her beloved childhood dog). So, with her rival gone, Clare makes another wish, that the guy she has a crush on, would fall madly in love with her. *Snap* Wish granted and soon enough the dude has only eyes for her! But, unfortunately, someone else has to die and that would be Clare’s crazy, and rich, uncle who perishes quite hilariously after slipping in a tub, awakening and then smacking his skull on the faucet. Unfortunate accident? Perhaps, but after learning they won’t be getting a dime from his, she makes YET ANOTHER WISH that she would inherit his assets. *Snap* Wish granted. Now she and her father live in a mansion, drive expensive cars, and she and her besties have access to basically an unlimited credit card. I think you get the idea, though even after three wishes and three deaths (a neighbor/friend gets done in), Clare still doesn’t seem to get it or, and perhaps this is likely but not presented very well, has become possessed with the power this box has on her. Soon enough, there are two more wishes and the suspense is supposed to be whose next and in one sequence it goes back and forth between her father or best friend, one changing a tire and the other stuck on an elevator. Basically, Wish Upon is Final Destination-lite, lots of deaths but not entirely creative and incredibly laughable, not to mention some awkward editing even in the unrated version: in one scene, a character is, I guess, being targeted after Clare makes yet another wish and gets speared through the eye, but the way it was shot, was so odd where I have to presume this was edited in a way to keep the original PG-13 rating. I don’t think this was a terrible film by any means and perhaps if it was meant to be darkly humorous in the ways the victims die — or not in the case of the rotting girl who seems to recover okay — I might appreciate it a bit more, but there came a point when the film just felt it ran out of material and the dramatics they try to throw in don’t quite land. 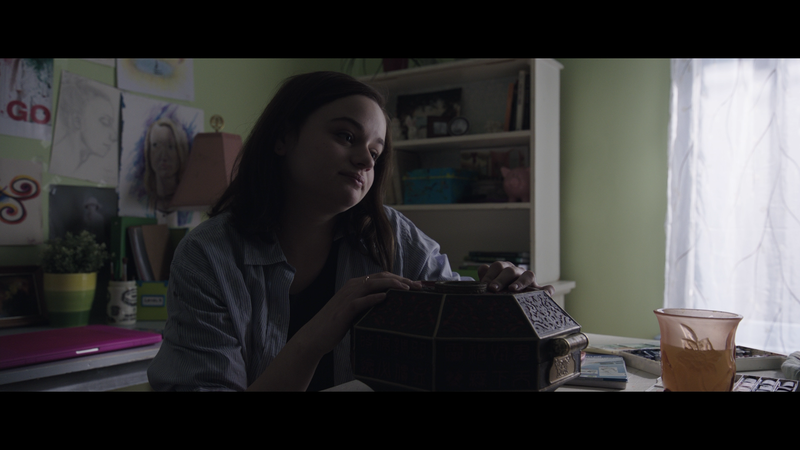 But for her part, Joey King isn’t bad in the lead here while the rest of the cast struggle with some bad screenwriting. This release comes with a DVD Copy. There are a few standard featurettes, but nothing spectacular totally only 7 minutes. I Wish (2:33; HD) has the cast sharing what they would wish for; Attic Tour with Joey King (2:11; HD) where the actress guides us through the attic set; Directing Darkness (2:32; HD) is John R. Leonetti, Joey King and other cast members discuss the horror genre; Motion Comics reveal stories behind the previous owners of the box. Wish Upon comes to Blu-ray presented with a 2.40 widescreen aspect ratio and a 1080p high-definition transfer (MPEG-4 AVC codec). The picture here is fine albeit quite dark even during the daylight scenes so there’s aren’t bright colors shining through. 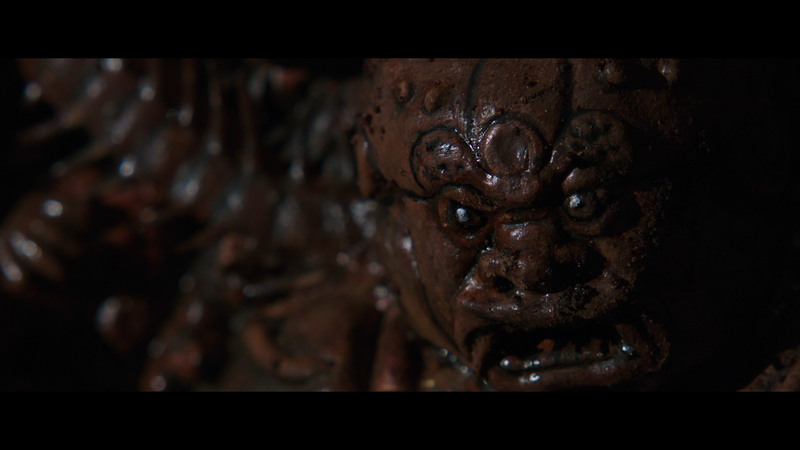 Still, detail is decent and there were no noticeable flaws like artifacts or banding. The DTS-HD Master Audio 5.1 track, like the video, isn’t exactly amazing but still effective with clear dialogue levels and there is even a kick from the LFE channel during a few scenes while the front and rear channels are relegated for the music and ambient noises. This is nothing remarkable yet still has some okay depth. Overall, Wish Upon could’ve been better but instead was another teen horror movie with some really stupid moments. The only saving grace is probably a respectable and wide-ranging performance from Joey King who does shine. The Blu-ray has some throwaway featurettes and the video/audio were both pretty good.